The leader of a pro-Biafran separatist group in Nigeria has apparently gone missing, prompting speculation as to his whereabouts on the eve of his trial on treason charges. Nnamdi Kanu, who heads the Indigenous People of Biafra (IPOB) movement, has not been seen in public since troops were deployed to the southeastern city of Umuahia last month. Kanu, who wants a separate state for the Igbo people who dominated the country's southeast, has been on bail since April. He is scheduled to appear in court in Abuja on Tuesday. His lawyer, Ifeanyi Ejiofor, told AFP: "Only the army can tell us where he is. Either they arrested him or they killed him. "If he is alive, they should bring him to the court on Tuesday." 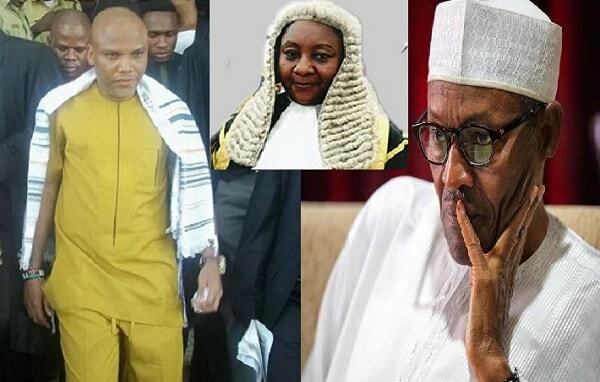 Justice ministry spokesman Salihu Othman Isah said whether the trial goes ahead depends on Kanu's appearance and the judge. "I can't tell you specifically what will happen," he added. Kanu's disappearance has prompted renewed fears of violence in the restive southeast, which remains tense 50 years after a declaration of independence sparked a brutal civil war. He was first arrested in October 2015 and held in custody until April this year, despite repeated court rulings that he should be released. In Umuahia, which was once the capital of the self-styled republic of Biafra and where Kanu spent his childhood, the windows of the family home have been blown out. The ochre walls and the cars parked in front of the building are pitted with bullet holes, according to an AFP correspondent in the city. Kanu's younger brother, Prince Emmanuel Kanu, maintains he was at the compound when soldiers attacked it on September 14. He said 28 people were killed but the army has denied the claim. Neither claim has been verified independently. "They were so numerous. They started to shoot from 200 metres (650 feet) away," Prince Emmanuel told AFP by telephone. "People were running for their lives. We had no guns with us." Prince Emmanuel said the military was holding his brother in secret. The government has dismissed the claim and said he was "hiding" somewhere. Nigeria officially declared IPOB a "terrorist organisation" in mid-September after violent clashes between the security forces and IPOB supporters. Members of the group were accused of attacking military checkpoints in Umuahia, which is the capital of Abia state, and the state's commercial hub, Aba. There was also violence in Port Harcourt, which is the capital of the neighbouring state of Rivers and Nigeria's main oil hub. Officially, the military said the troop deployment was part of its Operation Python Dance against crime in the region. IPOB said it was designed to curb its activities. Human rights organisations and analysts believe the authorities' response has exacerbated tensions in a region where separatist sentiment has never really disappeared. Many in the southeast say the region's lack of basic infrastructure and extreme poverty is a "punishment" for what happened in 1967. The charismatic Kanu, who is in his 50s, knew how to exploit those frustrations. He revived Radio Biafra and used to broadcast calls for independence from his home in London. Those calls increased after his arrest and sparked repeated demonstrations. Even after his release on bail, he rarely passed up a chance to whip up his crowds of supporters. Kanu wants a referendum on self-determination and has called for a boycott all forthcoming elections. Security consultant Don Okereke believes the army overstepped the mark by conducting law enforcement operations in the southeast that were normally the remit of the police. "(The) Python Dance exercise is an aberration. There's a high sentiment of distrust," he said. The federal government in Abuja has meanwhile opened itself up to the charge of "double standards" with the Biafra question, he added. On the one hand it is prepared to negotiate with Boko Haram insurgents in the northeast and militants in the Niger delta in the south but not IPOB, Okereke added. That was a high-risk strategy, he said, adding: "If anything happens to him (Kanu), the reactions are likely to be very violent in the southeast." In 2009, a military crackdown on Boko Haram led to the death in custody of its leader, Muhammad Yusuf. For now, rumours abound about Kanu's whereabouts. The British mission in Abuja has denied one claim from a former Abia state governor that Kanu was back in London.